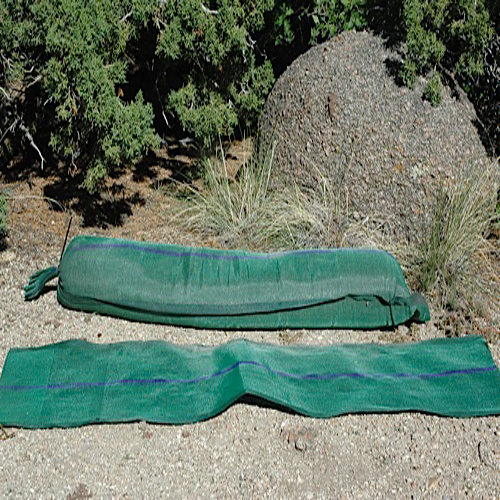 Snake bags, 11" wide by 1,500 foot continuous roll, allowing you to cut off what you need. Approx. six inch diameter when filled. Made of monofilament polyethylene material (4.73 oz per sq yard) with excellent UV resistance. Mesh size will trap particles as small as 0.1 fine sand. Excellent for collecting sediment & protecting storm drains, diverting water flows, and for ballast. Open mesh may allow very fine fill material to sift or wash out. Fixed rate of $200.00 for shipping in lower 48 states. Shipped on pallet via common carrier. Uses include BMP for stormwater compliance & management, erosion & flood control, and ballast for machinery, highway signage, tarps, and vehicle traction.